When it comes to marketing, colleges, universities, and other schools have unique needs. You’re interested in increasing your applicant pool, but also gaining insight and predictability into your admissions process. How can you be sure which applicants will actually enroll in your school? How can you set your school apart among the ever-expanding field of higher education options? At Innovative Marketing Resources, we know how to get the answers you need. We have developed an inbound marketing methodology tailored to the specific needs of higher education admissions and marketing. In this guide you’ll learn how we refined our inbound marketing strategy over years of successful engagements, helping schools like yours attract high-quality prospective applicants to their websites and nurturing their interest to the point of being ready to engage with admissions. How we developed the Content Marketer’s Blueprint, the online marketing methodology that has made us the premier inbound agency working in higher education today. Whether or not your school is a good fit for our process. How we will build and execute your blueprint, from onboarding through long-term retainer. How we use inbound practices like blogging, social media, and automated emailing to add fuel to your school’s inbound marketing engine. Why we’ll help you make the most of your HubSpot investment. How much our services cost. How you can get a free inbound marketing assessment for your school. 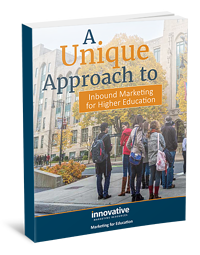 To learn how our unique approach to inbound marketing will help your school achieve its admissions goals, fill out the form on this page to access your free guide.